It's Facebook Fridays! for June 15, 2018, and you can be free from the curses, jinxes, and crossed conditions that enemies have sent your way! 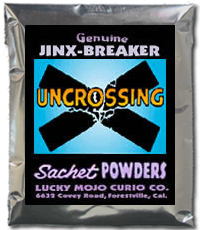 The Lucky Mojo Curio Company is holding a random drawing to give away 3 liberating Uncrossing spiritual supply prizes. This week each of our lucky winners will receive a bottle of genuine, hand-made Lucky Mojo brand Uncrossing Oil for dressing candles and doorknobs, along with a packet of Uncrossing Bath Crystals for bathing and floor wash, and Uncrossing Sachet Powders to dust on the body or petition papers. First thing tomorrow morning, we will select THREE winners at random, announce their names here, and ask them to message this Facebook Page with their mailing addresses, so we can send them their FREE Uncrossing products. Thanks for publishing this in the Forum, Ernie. We have a winner! In fact, we have 3 lucky winners! Our Facebook Fridays! winners for June 15, 2018 are: Tieya Gee, Maxine Turner, and Chris Grabarkiewctz.